D Sands Condominium Motel, oceanfront Lincoln City. 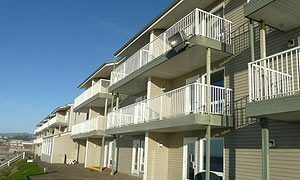 Go Straight to D Sands Condominium Motel, oceanfront Lincoln City. Every room is beachfront, and it's all right up against Lincoln City's most famous stretch of beach, next to the D River. Getting a free, fresh baked cookie upon check-in is just the beginning. Each room comes as a suite or mini-suite and has a kitchen and balcony or patio. Some have gas fireplaces, while all have DVD Players with movies available for renting (and movie rentals come with free popcorn). There's a heated indoor pool, a spa, and this fabulous beach is lit at night. Rooms sleep anywhere from two, four to six - including a deluxe fireplace suite. Gift certificates are available, and special occasion packages are offered as well. 171 S.W. Highway 101, Lincoln City, Oregon. 800-527-3925. www.dsandsmotel.com.